Shirley grew up in New Jersey where she was an all-state lacrosse player in high school. However, upon realizing it would be difficult to find another 2 dozen or so players required for a lacrosse game, she made the switch to tennis. Shirley graduated from Connecticut College with a Bachelor of Arts degree in American Studies. Shirley is a certified USPTR instructor with over 23 years of teaching experience. She gained recognition as a player and coach during the early 90’s through her active membership in the Lawn Tennis Association of England. As a proponent of the David Gabb “Tennis Technique”, she taught at the David Lloyd Club in Eastbourne and captained her club’s ladies tennis team in North London. She reached the singles final of the All London 35 and over and played 5.0 USTA for several years in CT.
She enjoys teaching men, women, and children of all ages with various ability levels. 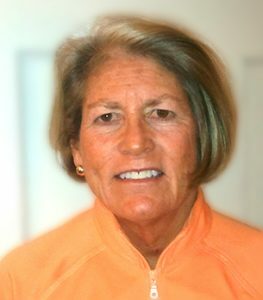 In addition to teaching programs through Westport Parks and Recreation and Fairfield County Tennis for several years, Shirley has also taught at local clubs, including Patterson, Westport Tennis Club, and Sylvan, as well as at the Sandpiper and Coral Reef Resorts in Barbados. She coached the Greens Farms tennis team for 14 years, the Fairfield Town tennis team for 8 seasons, and most recently the Westport Junior USTA team in 2016.